關於成龍溼地的中文簡介及目前所進行的環境教育計畫, 大家可以參考這個連結, 或至”成龍溼地三代班“部落格逛逛, 有任何需要進一步說明的地方, 可以留言. 另外我們也會持續update關於成龍村及成龍國小的相關資料至部落格中, 敬請期待!! 🙂 Happy New Year!! Cheng-Long Wetlands is a developing wetlands of over 100 hectares located in rural Yunlin County, on the South-central coast of Taiwan. The Cheng-Long Wetlands are very close to the ocean (Taiwan Straits) and the climate is tropical with warm days and nights all year. There are several small villages nearby, and people here usually make their living from fish farms and agriculture. In the village of Cheng Long there is an elementary school with 75 children in grades 1 – 6 (about ages 6-12). In Cheng Long there is also a temple and several small shops, but it is a simple town with mostly a traditional life. The community is economically depressed now, and most young people leave to find jobs elsewhere. 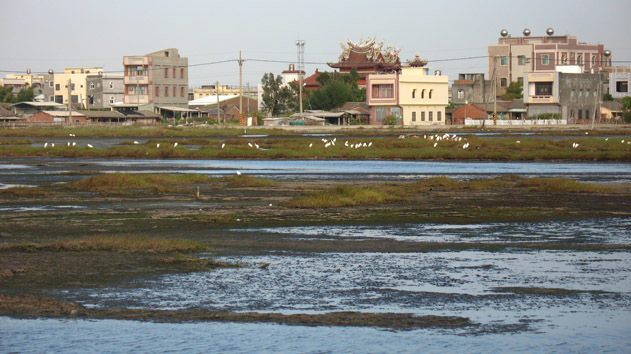 The Cheng Long Wetlands are beautiful expanses of shallow brackish water with lots of wildlife such as crabs, fish, etc. and water plants such as reeds. In a village that is close to Cheng Long there are many oyster farms with huge piles of white oyster shells. Below is a map (coming soon) of Taiwan that will show you the location of Cheng Long Wetlands, Cheng Long village, the Taipei Taoyuan International Airport and the Chiayi High Speed Rail Station. Chiayi is the closest city to Cheng Long with a High Speed Rail Station. The Chiayi HSR Station is about one hour by car from Cheng Long. It is a little over one hour from the Taiwan international airport (Taoyuan International Airport) by the high speed rail system to the Chiayi HSR Station. ChengLong Wetland, a land-subsidence area, used to be a rich and fertile field. Now you can see that old wire poles and a little temple soak in the water. 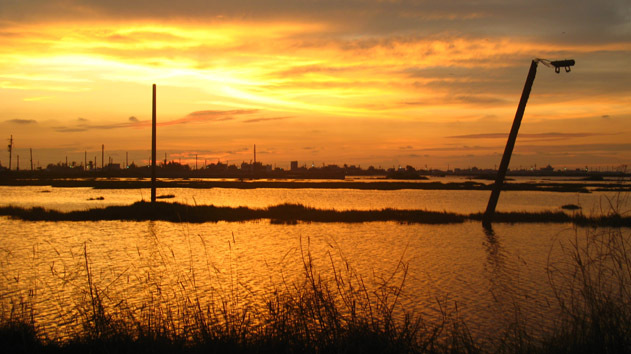 The wetland was preserved by the Forestry Bureau,the supreme conservation authority in Taiwan, from 2005. 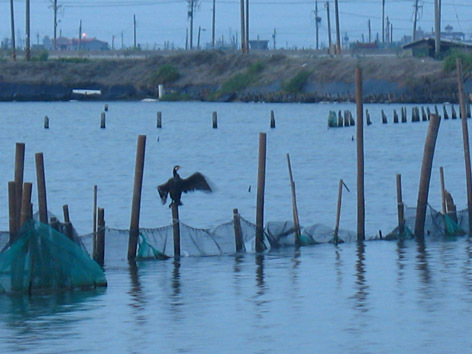 It is now an important habitat of water birds. Kuan Shu Educational Foundation is invited by the Forestry Bureau to help with the Environmental Education affairs of Cheng Long Wetland from 2009 summer. This is the ChengLong Wetland and the ChengLong village. A part of the wetland is dry during winter time. In oder to understand the wetland, we do regular investigation every month. The school children join our investigation after school. The colorful wall was painted by the school children. This cormorant with a broken arm is observed by all the community. Children call him 'the president of the wetland'. 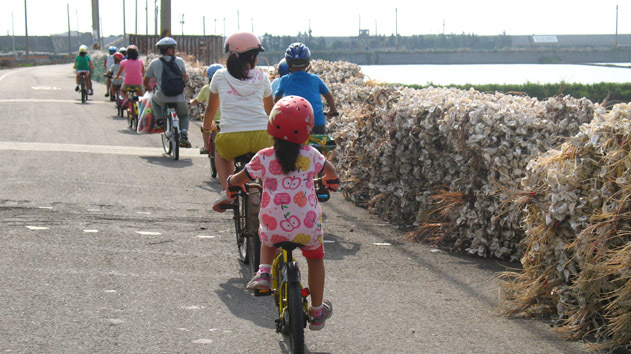 Biking is a good way to explore the communities around the wetland even though it is sometimes very windy. It is about 5 mins by walk from the wetland to the Chenglong Elementary School. The school supports environmental education programs a lot. Hope the ChengLong Wetland could be a sweet and comfortable HOME for birds and everyone. Yes!! Let's make a difference for our wetlands and communities together! This is a great conservatory project for the land and migrating birds!! I really appreciate your doing this!! Bravo!!! One comment though is the use of English as the primary posting language. This, indeed strikes me greatly!! (Please correct me if I have missed a version in Traditional Chinese somewhere.) By seeing posted photos, I would assume this is a site native to Taiwan! However, all captions and most site descriptions seem to limit this site to English-literate people. Local to Taiwan, I assume you would leverage local efforts to develop a stronger project. As a result, to the least, your current efforts should be communicated to the locals and be understood by them – making it more accessible (understandable) would be the first step. I understand the use of English might aid to global visibility. Local powers would not be undermined!! C’est formidable de pouvoir suivre depuis la France ce que vous êtes en train de faire à Taïwan et de voir toutes ces énergies et l’intérêt autour de votre évènement. L’équilibre entre l’utilisation du chinois traditionnel et de l’anglais est plutôt réussi. Les traductions automatiques des articles rédigés en chinois, sont imparfaites sur mon écran et il est très utile pour moi, française, d’avoir le commentaire anglais afin de mieux comprendre tous les interlocuteurs. Je m’exprime volontairement aujourd’hui en français et vous pourrez lire la traduction de ce post dans votre langue avec je suppose les mêmes imperfections. 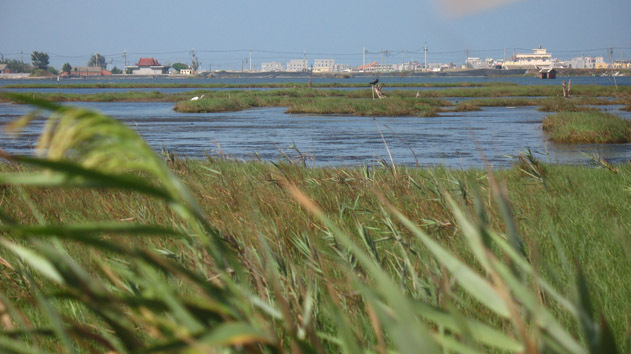 Nous avons, en France, une zone humide, semblable à la vôtre, la Camargue, chaque année, nous allons dans cette région pour profiter de cette grande fête du printemps, du grand retour des oiseaux migrateurs et de la diversité de la faune et de la flore de ce milieu. Au plaisir de vous lire et de vous accompagner dans cette découverte virtuelle, Edith Pourchaire. It is wonderful to get your comment on our Blog about the Cheng Long Wetlands International Environmental Art Project. I can read your French and understand it okay! Much of this Blog is written in Chinese and some in English, but we are happy to have your thoughts in French too. I know the project at Camargue, and an artist who will be there this year also came to Taiwan last December to make an artwork for a project I did at the National Museum of Marine Biology and Aquarium in south Taiwan. His name is Thierry Godet, and I am sure he will also do a good work at Camargue. The project at Cheng Long Wetland was wonderful and a great experience for all. Please take a look at the photos of the finished artworks in my next Post on the Blog. Yes, we speak about “Art in situ Camargue”, the curator for which is Abdel Oustad. I saw pictures of works of Thierry Godet, we’ll be in Camargue in May. I am very interested in what you are doing and wonder if can add some inofrmation about the botany and some water issues. I would like to know the names (including botanical names) of the predominant endemic plants which grow in this wetland community? Please differentiate if you can between the salt marsh communiies and the ephemeral communities and any fresh water communities that make up the Cheng Long Wetland and any adjacent areas which may form part of the Stormwater disposal system for the greater Cheng Long area e.g. streams, channels, culverts and drains. How is sewage and waste water reticulated and treated in the area? Are there any water pollution issues and if so, are they handled properly by the local council authority? 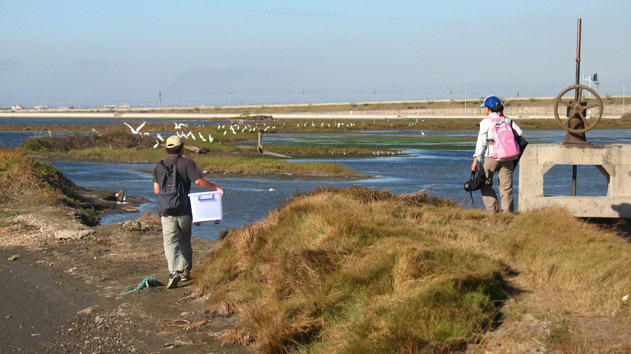 Does treated effluent end up in the wetland? I hope you can answer these questions. Hello, John, thanks for being interested in our art project. Are you an artist or a botanist or an environmentalist ? May i ask how do you know our project? As for the water in the wetland, it is from the rain and fish farms. There are many channels connect the sea with fish farms. Water gates are used for controlling water. We haven’t found any big water pollution issues at ChengLong Wetlands. All birds here are very healthy and no disease used to be found here. Hope this information helpful, maybe Jane will give you some more answers later. I think Chao-mei answered most of your questions, and I really do not know much about the water pollution issues or how the sewage is treated in Cheng Long. Since I live in Taichung and come there in April and other times to visit and work with the artists, I do not know so much about the government and water and sewage issues. Maybe Chao-mei can find out more about that later. 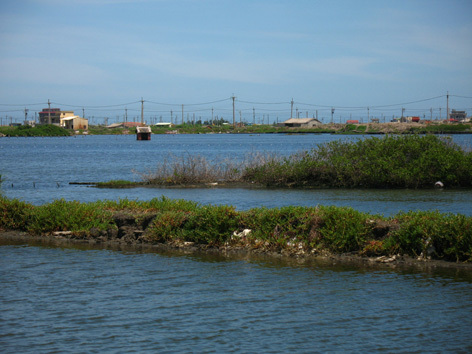 The water in the wetlands is brackish, a combination of salt and fresh water, and it is difficult to grow things there because the soil is also salty. Reeds are the most common plant that artists have found useful in the previous years. The Wetlands were caused by the land sinking due to too much pumping out of the underground water and also because of typhoons and storms that brought too much rain. The land is still sinking in this part of Taiwan, and so rising water is a continuing problem. 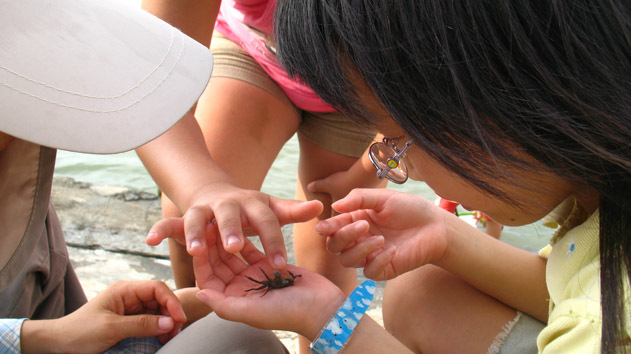 We will continue to put information on the Blog that can help people to understand the wetlands and this area of Taiwan. Thank you again for your interest in our project in Cheng Long, Jane. 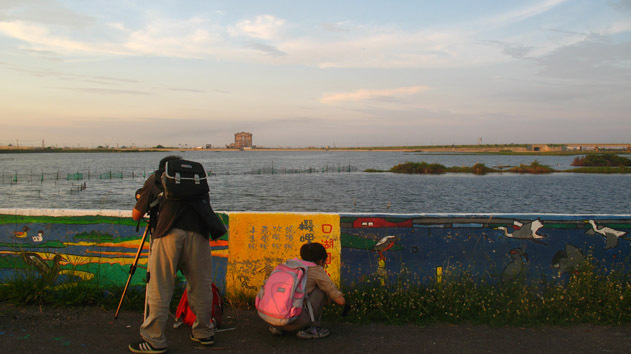 Thanks so much for your enthusiasm about our art project in Cheng Long Wetlands, Taiwan. To answer your question about materials: I agree the old wood from school chairs and fences is beautiful, as well as the old bamboo. I think we can find enough to make large scale artwork with these recycled materials. So, send your proposal and sketch for the idea and if you are selected as one of the artists, we will start to collect the things you need. The photos on the Blog of possible materials are just to give some ideas of what might be used, and artists should remain flexible to adapt their ideas and make changes when they get here and see things in person. Thanks again and just let us know if you have any further questions. Hello Jane and involved in Cheng-Long ! How wonderful to know about the project and importance. The various materials and available locations lead the imagination to draw differents types of sculptures and installations. Interested me very much in how the activities of psiculture and aquaculture became the main occupation of the local population. I read about how the wetlands were formed, would like to know since when this is happening and how it is perceived generally by older residents. So nice to get your comments about the Cheng Long art project. 2012 will be our third year for the art project with the international artists coming there to make environmental art installations with the participation of the community and school children. When we started in 2010 the children and the older residents were a little shy, and some not used to seeing foreigners or even people from other places in Taiwan. Now they are very friendly and welcome the artists and the art project each year with great enthusiasm. The older residents also help the artists as volunteers and some provide food and snacks and even accommodations for the artists and other volunteers who come each year to help with the art project. 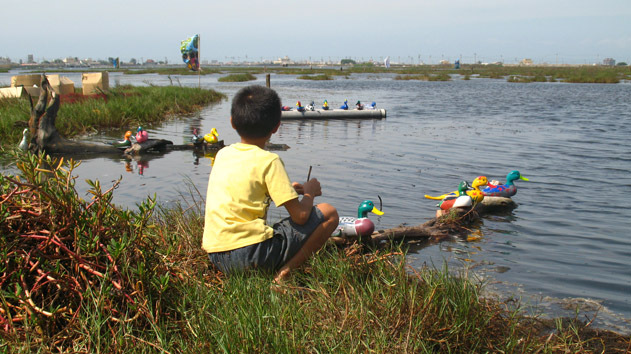 The art project has truly revitalized the community and now they start to understand how the artists can help bring new energy and new ideas and that maybe the wetlands nature preserve is a good place and makes their community special with this art project and the wildlife. I look forward to seeing your proposal before the deadline of Feb. 8, 2012 It is exciting to see so many artists around the world interested in this project and coming to make their artwork in Cheng Long. Thanks again and keep watching the Blog! Hi Jane – We are excited to see the announcement for the 2013 project and we will be back in Taiwan at that time so are really really keen to come visit again. Hopefully this will be possible, we have 2 weeks from mid-April. It is great to hear from you and to learn that you will be coming back to Taiwan in 2013. We would love to have you visit us again in Cheng Long village and see all the artists at work and interact with the children there again. The Cheng Long elementary students you met in 2011 will maybe be in junior high school now, but we can tell them you are coming and I know they will want to see Duncan and Briony again! It will be fun! Please keep in touch to let us know when you will come to Taiwan. Our art project dates are set now from April 11 – May 6 so probably the last part of April is a good time! Hi, my name is dhaneshwar shah, your idea and work both is great. Because you are using an art for future, trying to connect art with nature, otherwise art is always deal like an object for home, gallery or museum. It my great wish to attend any program there and would like to learn from that place, finally your place able to give a pure breath for artist and his art work. Thanks for your interest in the Cheng Long art project. We will put the Call for Proposals on this Blog in a few days. Just check again to make sure you have all the information about what to send and we welcome your proposal too. Hello Jane! My name is Rebeca and I’m from Portugal! I can not begin to tell you how excited I am for discovering about this beautiful environmental project in Taiwan. I currently study Fine Arts in a portuguese university and I would love to apply to your 2014 project. Where can I do that? Are there any requirements? Hi Rebecca, Thank you for your interest in this art project in Taiwan. You can see the complete Call for Proposals for the 2014 Cheng Long Wetlands International Environmental Art Project on this Blog in the next few days. We are getting it ready to post now! Hope you will send in your application materials after you read over the full details about the Call for proposals in 2014. I just discovered the Cheng Long spiral in search of Asian eco art projects for a poster exhibition I’m doing at the World Congress of Soil Science next year… SO NICE to see you here and that you’re involved in this! Yes, I remember mentioning this Cheng Long Spiral work by Indonesian artist Firman Djamil to you before when we were corresponding by email about your soil and art project! This artwork by Firman could be presented at your session in 2014 perhaps along with other works by artists in that year 2011 when the theme was “Dreaming of a Greener Wetlands” and we emphasized ways of making the Wetlands greener by helping plants to grow there and also using “green” to mean in general a better environment. Most all the artworks that year has some relationship to soil such as the “Flying Boats” that had plants growing in them and the “Floating Garden”. I can send you that year’s catalog if you are interested and send me your current mailing address….or maybe I can figure a way to send a .pdf file of the catalog. I think really Firman’s work is best for the soil related art idea. I heard from the Kuan Shu Foundation Education director (Chao-mei Wang) that sometimes they do soil testing for PH in the Cheng Long area so that the children can understand this and how difficult it is to grow things there. When I am there in April-May 2014 I can ask them more about soil and management strategies they have tried. It has been amazing to me to see over the 5 years I have been going to that village that there are now many gardens for growing vegetables and even flowers blooming when before there was nothing growing there! I think maybe the art project has brought some new life to the village and also made the local people have more pride in their village and want to make the soil grow things again. 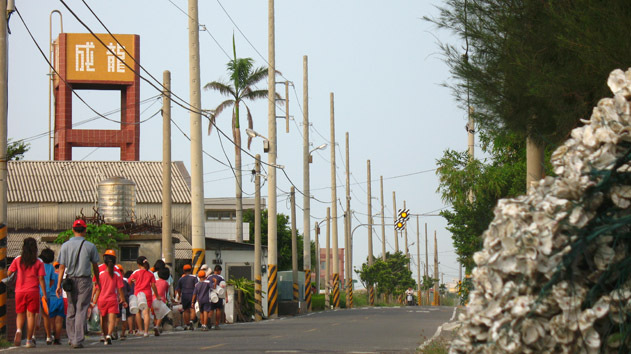 Hello, Cindy, and thank you for your nice comment on our environmental art project in Cheng Long village, Taiwan. I have seen reproductions of that painting called “Fishing among Reeds” but I don’t know about the artist. You could try looking at the website for the National Palace Museum in Taipei and maybe someone there can help with your research. Good luck with your research.